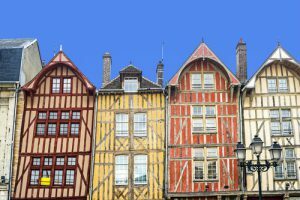 Troyes is a city of history, beauty and outlet shopping and all just one hour from our depot! 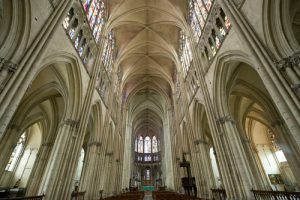 We just had a great weekend break in the city of Troyes and were amazed that we had not visited it before as it is loaded with historical and architectural treasures. Pretty cobbled streets, half-timbered buildings, a beautiful cathedral and a bustling city centre make this a great place to spend a couple of days. A big municipal campsite sits at the edge of the city, and they even rent out bikes for getting into the city centre (handy if you don’t have any with you). The campsite offers good facilities with a pool and restaurant on site and costs around €20 per night for a couple in a motorhome with an electricity supply. If shopping for designer labels appeals, Troyes is the biggest European shopping centre for big name brands with 210 factory outlet shops at the McArthurGlen Outlet. You can also visit the Regional Park and Lake Orient just 20 kilometres away with hundreds of outdoor leisure activities from swimming beaches to cycle and hiking paths (including the “VeloVoie” which links the park to Troyes city). Our favourite meal of the weekend was at the restaurant Ô des Lys right in the city centre. Carla and Daniel, the husband and wife team that owns and runs the restaurant, took great care of us and we had an excellent meal at a surprisingly good price. Do book ahead if you go there as it is pretty tiny and they were turning away other diners by about 8pm. Troyes is just an hour from our depot and despite it being on our doorstep, I had not discovered it until now. A weekend was really not long enough to fully explore it and I left wanting more of this lovely city. 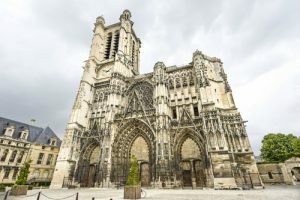 Take a look at the Troyes Tourism website for more information and ideas.